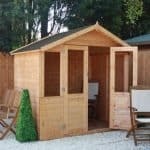 The Rowlinson Eaton Summer House offers a classic design and natural timber colour that make this summer house blend into your garden with ease. Large windows and a 9x7ft interior mean that the summer house enjoys a pleasant, light-filled environment. A couple of stylistic elements make this summerhouse stand out from the rest of its kind. Firstly, you’ll notice it has an attractive overhanging roof. This actually adds more shelter and shade, so it really adds value. That roof has mineral roofing felt on it for added protection against rainwater. On the roof and the floor is 12 mm tongue and groove cladding so that you have extra protection against the elements. It’s tough wood, and it’s protected too, with a 10-year anti-rot guarantee. Toughened glass in the windows and door make for a great building. 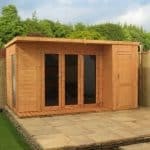 The Eaton summer house could serve many uses, including, but not limited to, a relaxing garden room, an outdoor dining area, a hobby room or art studio. It could alternatively be used as a storage solution for your outdoor and garden equipment. Whatever, you wish to use the space for the extra living space will make a wonderful addition to your garden. 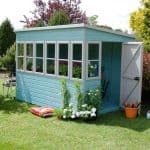 Whether you dream of having extra living space in the form of a summer house for relaxing in the garden, a place to work on your hobbies or simply a great storage solution, you may have a list of criteria that you wish to fulfil. 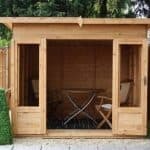 In this section we take a look at the Rowlinson Summer House in further detail to help you make an informed purchase decision and choose the best summer house for your needs. Exterior: The summer house exterior has a natural, dipped honey-brown timber finish with 12mm shiplap cladding which provides a traditional look and high quality feel. Painting the summer house a colour of your choosing can give it a unique and personalised appearance, making a real feature within your garden. Interior: The 9x7ft summer house interior is slightly larger than other summer houses at this price range and due to the rectangular shape it has great potential for creating the room of your dreams. Use the summer house for a variety of reasons, from an outdoor office to a storage solution. Furniture and freestanding storage may be added to use the building to its full potential. Windows & Doors: The tall and narrow windows are to the front of the summer house, either side of the fully glazed double doors. This means that a great amount of light may enter the interior, providing a wonderful environment in which to spend your time and enjoy views out to the garden. Security: Although the Eaton summer house does not come with a security fitting already installed, it would be a straight-forward process to add a security fitting yourself, which can be purchased independently at a modest price. 9 x 7 Rowlinson Eaton Summer House: How easy to build? It is recommended that the Eaton Summer House be assembled by two people due to the size of the parts and for safety reasons. We expect that the summer house could be assembled within a day by those with a basic knowledge of tools and DIY. You will be required to provide a basic set of tools for assembly, however all of the panels, fixtures and fittings required will be provided in your package. The step-by-step instruction manual makes assembly straight-forward and the easy-to-follow diagrams will keep you on the right track. 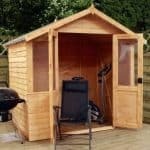 9 x 7 Rowlinson Eaton Summer House: What is the overall quality like? 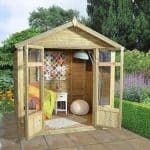 This Rowlinson summer house looks fantastic in the pictures but does it have the high quality construction to match? In this section we take a look at the overall quality of the summer house. The wall panels and interior flooring is constructed from 12mm tongue and groove timber cladding that is both durable and protects the interior from the elements, as well as rot, damp and mould. The mineral roof felting and toughened glazing also add to the summer house’s sturdiness. The summer house is supplied in a natural dipped honey-brown finish; however it may be painted if you wish, either to match existing garden furniture or to make a feature within your garden. 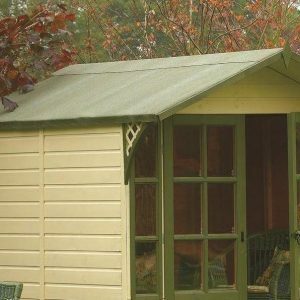 The summer house requires little maintenance apart from a yearly treatment which must be applied to adhere to the 10-year anti-rot guarantee. 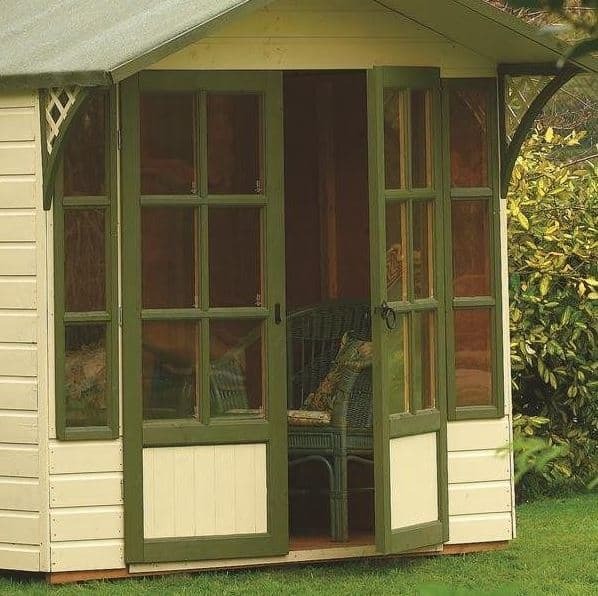 The Rowlinson Eaton Summer House is a wonderfully classic design with a vintage feel in its colouring and style. The 9X7ft shed interior can accommodate a range of items, from furniture to hobby items and gym equipment, to cater for your needs. Gain some much wanted extra living space and start enjoying the views out to your garden with the long windows and gazed double doors. 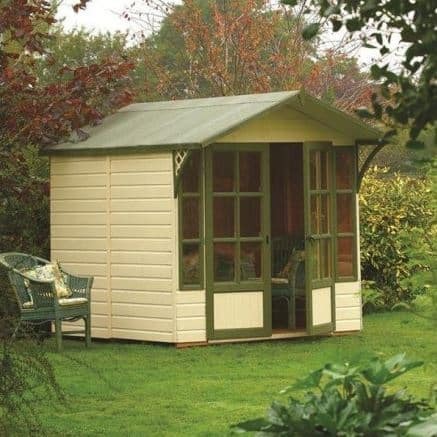 At this fantastic price, you can enjoy a summer house in your garden for less than you think! Very disappointed with this product. The roof timbers were too flimsy and had to be replaced. Many timbers were not planed and are rough. Knots in wood have fallen out leaving holes in the walls. The floor creaks because the floor panels are too thin. 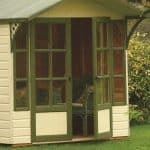 I would not recommend the Eaton Summerhouse and consider it unfit for purpose. Purchased May 2018.